There are only seven great ape species, of which man is one, on Earth. That is, until now. 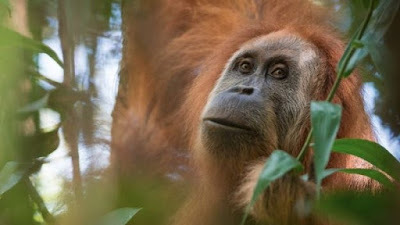 Biologists have determined after twenty years of study that an orangutan living in the Sumatran rain forest is a separate species. Only 800 exist, so they will be immediately listed as endangered. The Tapanuli orangutans (Pongo tapanuliensis) were located in 1997, but their unique genetic identity was undetermined until today. There are two other species of orangutans, Sumatran and Bornean, that were determined to be unique in 2001. Tapanuli orangs live in Batang Toru, south of Lake Toba, and are isolated from their northern relatives, the Sumatrans. A genetic divergence is thought to have occurred 3.4 million years ago based on genomic analysis. Orangutans are the most distant relatives of Homo sapiens. A video from the BBC showing our new forest-dwelling cousin in its native habitat can be viewed here.